Binh Ngan Construction and Import Export JSC., presents the new range of air cooler from India Symphony Diet 22i. The Symphony Diet 22i cooler is a compact air cooler for your home, office. With intelligent i functions, you can manage to control the speed of air cooler and set timer as desired. For roomup to 14-16m2, this appliance consumes 170w. Operating cost only equal the costof one or two light bulb. – Air coolers areenvironment-friendly. 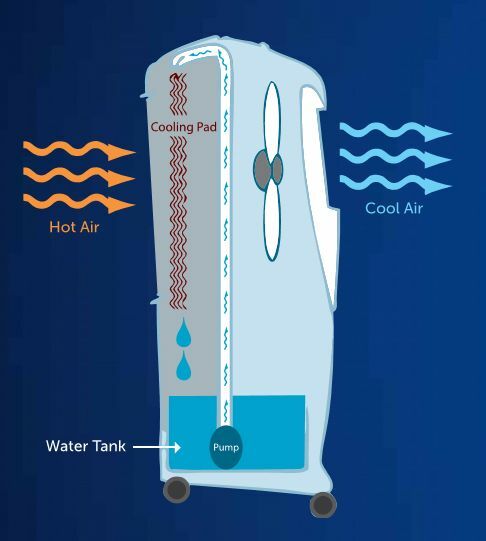 Unlike air conditioners, which release CFC gas, aircoolers do not emit hazardous greenhouse gases responsible for global warmingand other environment-related problems. – Air coolers consume only about 5-10%electricity compared to air conditioners. – An air cooler can be used in openspaces (gardens, terraces and verandas) where an air conditioner will not beeffective. Cảm ơn 677 Quý khách đã tín nhiệm sản phẩm Air cooler Model Diet22i từ ngày: 31 December, 2014 công ty Quạt công nghiệp Bình Ngân JSC phân phối toàn quốc.